Would you like to receive automatic email reminders two days before each market? If so, follow this link to the useful tool provided by the Kent Farmers' Market Association (KFMA). We are not longer collecting this at the market. Southern Water still want people to keep this out of drains, so continue to put it into bottles. Then, take the oil to the recycling depot, or simply pop it into your landfill bin. Better there than down the drain! Our mission (and we don't have a fancy "mission statement") is to provide good-quality, value-for-money and above all local produce. 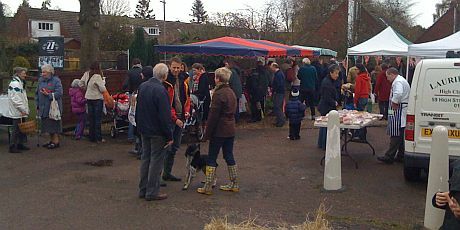 We have been running since November 2010 and our market is not only a great place to buy food, but it's a great social event too. On our stalls page, you can find out more about our stallholders and their products, as well as a list of who's going to be at our next market. Want to have a stall? You can download our policy and stallholder agreements from our documents page to get more information before calling us.